How do three sisters write a single suicide note? This is the riddle the Alter sisters--Lady, Vee and Delph--pose at the outset of this darkly funny novel as they finalize their plans to collectively end their lives on New Year's Eve, 1999. Their reasons are not theirs alone, and they prove that the sins of the father are indeed visited upon the children, even to the third and fourth generations. The Jewish Alter family has been haunted by suicide ever since the sisters' great-grandfather, the Nobel Prize-winning chemist Lenz Alter, developed the first poison gas used in warfare and also the lethal agent used in the gas chambers of the Third Reich. Lenz and his wife, Iris, their son Richard and his children, Rose, Violet and Dahlie, all took their own lives. Now Dahlie's children are the only ones remaining. Lady, Vee and Delph love one another fiercely and protect one another from the shadows of the past through a shared sense of dark, deeply brilliant humour. As they gather in the Upper West Side apartment in which they were raised to close the circle of the Alter curse, an epic and achingly human tale--inspired in part by the true story of Fritz Haber, Nobel Prize winner and inventor of mustard gas--unfolds. Part wry memoir, part unflinching eulogy for those who have gone before, this is an intensely personal but profound commentary on the events of the 20th century. As one of the characters remarks, "Too bad Lenz Alter didn't invent Prozac instead of chlorine gas; that probably would have saved them all." 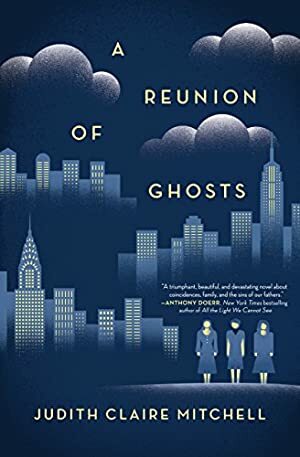 Judith Claire Mitchell's epic narrative captures three unforgettable characters--and their haunted family--within one brutally witty, achingly human voice. Log In to track Judith Claire Mitchell on eReaderIQ. to be notified each time the price drops on any book by Judith Claire Mitchell. to stop tracking Judith Claire Mitchell. This book was $13.99 when we started tracking it. The price of this book has changed 9 times in the past 1,161 days. The current price of this book is $11.99 last checked 3 months ago. This lowest price this book has been offered at in the past six months is $6.99. The lowest price to date was $1.99 last reached on May 21, 2018. The highest price to date was $13.99 last reached on February 15, 2016. This book has been $13.99 one time since we started tracking it. We last verified the price of this book about 3 months ago. At that time, the price was $11.99. This price is subject to change. The price displayed on the Amazon.ca website at the time of purchase is the price you will pay for this book. Please confirm the price before making any purchases.